Friedwardt Winterberg’s work in nuclear rocket propulsion earned him the 1979 Hermann Oberth Gold Medal of the Wernher von Braun International Space Flight Foundation. Winterberg is well respected for his work in the fields of nuclear fusion and plasma physics, and Edward Teller has been quoted as saying that he had “perhaps not received the attention he deserves” for his work on fusion. Winterberg also did the basic design work that was developed into the global positioning system. A major stimulus for the project Daedalus was Friedwardt Winterberg’s inertial confinement fusion drive concept for which he received the Hermann Oberth gold medal award. launching of large payloads into low earth orbit, but it was abandoned because of the radioactive fallout into the earth atmosphere. The idea is here revived by the replacement of the small fission bombs with pure deuterium-tritium fusion bombs, and the pusher plate of the Project Orion with a large magnetic mirror. The ignition of the thermonuclear fusion reaction is done by the transient formation of keV super-explosives under the high pressure of a convergent shock wave launched into liquid hydrogen propellant by a conventional high explosive. If you get rid of the fission bomb trigger, then a pure fusion bomb has no fallout. Under normal pressure the distance of separation between two atoms in condensed matter is typically of the order 10^-8 cm, with the distance between molecules formed by the chemical binding of atoms of the same order of magnitude. Calculations done by Muller, Rafelski and Greiner show that for molecular states 35Br- 35Br, 53I- 79Au, and 92U- 92U, a twofold lowering the distance of separation leads to a lowering of the electron orbit energy eigenvalues by ~ 0.35, 1.4 keV, respectively. 100 million atmospheres of pressure should enable those molecular states to get to lower atomic separation. This matter produced from high pressures would make a super-explosive beyond regular chemical explosives and would be enough to trigger ignition and propogated burn of deuterium and tritium fusion. The propulsion unit is very similar to the one in a previous publication, where the fusion bomb assembly is placed in the focus of a 10 meter-size large metallic reflector, positioned around the focus of a magnetic mirror. The expanding fire ball compressing the magnetic field will there generate surface currents in the metallic reflector, making a magnetized plasma layer protecting the reflector from the hot plasma. 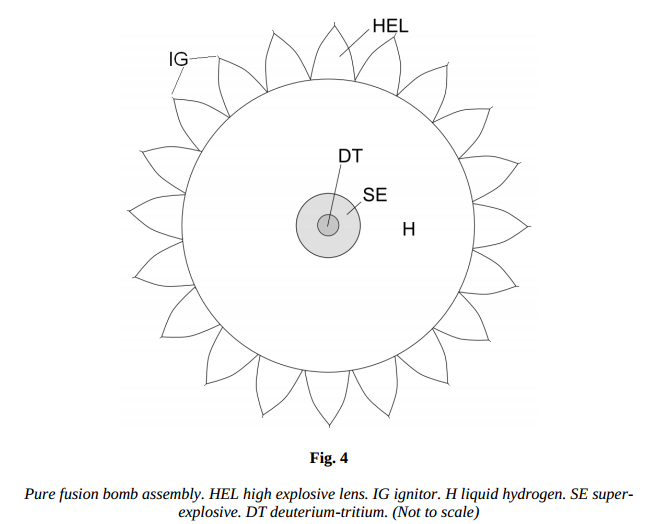 The meter-size hydrogen sphere of the mini-fusion bomb is transformed into a fireball with a temperature of ~ 10^5 K, or somewhat higher, with an exhaust velocity of ~ 30 km/s. Cooling the metallic reflector can be done with liquid hydrogen becoming part of the exhaust, as in chemical liquid fuel rocket technology. This is unlikely to amount to more than 10% of the liquid hydrogen heated by the neutrons of the fusion explosion. A meter-size ball of liquid hydrogen heated to 10^5 K, has a thermal energy of 10^18 erg, equivalent to 25 tons of TNT. At this temperature the pressure is ~10^11 dyn/cm2. If the fireball expands from an initial radius of Ro ~1 m to R1 ~10 m, the pressure goes down to 10^9 dyn/cm2 ~10^3 atm, which is about 2 orders of magnitude smaller, and less than the tensile strength of steel. At this pressure, the magnetic field strength at the surface of the steel will be of the order 10^5 Gauss. The energy released by the eddy currents in the reflector can hardly be more than 10% of the energy released in the fusion explosion. The mass of a meter-size ball of liquid hydrogen is of the order 0.1 tons, such that 0.01 tons of liquid hydrogen would be available for the cooling of the reflector. The pressure of ~10^9 dyn/cm2 acting on the metallic mirror is transmitted to the space-lift to produce thrust. Because the thickness of the parabolic mirror is small in comparison to its radius, this would lead to a large circumferential hoop stress on the mirror, larger by a factor equal to the ratio of radius of the mirror to its thickness. This requires that the mirror be supported by external forces. These forces could be realized making the mirror’s thickness comparable to its radius, which for a mirror made from steel would make it very heavy. Adopting an idea by P. Schmidt and B. Pfau, who had shown that the wall thickness of cylindrical and spherical pressure vessels can be greatly reduced by surrounding them with a thick compact layer of a disperse medium composed of high tensile strength micro-particles. As shown below, to utilize this effect, the metallic mirror is placed inside a box filled with a compactified disperse medium, such as SiC (carborundum) or AlO3. If the disperse medium consists of mono-crystal particles (“whiskers”), it has a compressive strength of the order ~10^11 dyn/cm2. Because of the friction between the particles of the disperse medium, a shear stress is set up in the medium which makes possible the radial reduction of the stress in a spherical configuration. A thermonuclear space lift can follow the same line as it was suggested for Orion-type operation space lift, but without the radioactive fallout in the earth atmosphere. With a hydrogen plasma jet velocity of 30 km/s, it is possible to reach the orbital speed of 8 km/s in just one fusion rocket stage, instead of several hundred multi-stage chemical rockets, to assemble in space one Mars rocket, for example. At an exhaust velocity of 30 km/s using 1 ton of hydrogen per second would produce 3000 tons of thrust. To stabilize the spacecraft against tilting, at least 3 propulsion units would be needed. With one propulsion unit expelling 0.1 tons of hydrogen at 30 km/s, this would require a cluster made up of 10 units, sufficiently large to stabilize the craft. The ten rocket units would produce 30,000 tons of thrust (294200 kN of thrust). The Saturn V had 34000 kN of thrust. So 8.6 times as much thrust as the Saturn V. The Saturn V weighed 2800 tons on the ground, but this would be a single stage to orbit nuclear rocket that could deliver about 50% of the mass to orbit and 15-30% of the mass to Mars. The launching of very large payloads in one piece into a low earth orbit has the distinct advantage that a large part of the work can be done on the earth, rather than in space. The proposed thermonuclear space lift would for this reason permit to launch the bulk of a large spacecraft directly into orbit. The feasibility of the proposed concept would be of great significance for the future of space flight. It does not require a large number of chemical rockets to bring the parts of a Mars craft, for example, into low-earth orbit. And it would not require the Mars craft to be assembled there, which would need to be done by a large number of people in the weightless vacuum of space.